Being debt free has got to be one of the best feelings that exist. Your mind is clearer, your life is less stressful, and your general well-being and happiness just skyrockets. I’m sure many of you are already there and there’s just as many of you quite not there yet. Today’s post is going to be a story of how I helped my girl friend become debt free. I can assure you her life has changed and her spirits are sky-high these days all because she is debt free. I’m hoping some of this will rub off on a few of you and help you reach a debt free life sooner. A little background first though, I have now known this beautiful, sweet lady of mine for about 6 years. She was the receptionist at a software job I had a few jobs ago and that is where we had first met. We immediately became friends and were just that for the next 4 years. During those 4 years, she actually moved away to a different state for a few years and we still kept in touch. She eventually decided to come back home 2 years ago and that is when we went from friends to lovers! Haha okay that was corny. Lets just say that things escalated, one thing led to another and a few months after her return, we were officially an item. Fast forward to earlier this year, by this time we had now been together for about a year and a half and everything was just fine and dandy on the home front however not so fine and dandy on the financial front. You see my girl friend was about 18k in debt and only getting worse. She carried balances on multiple credit cards and was only paying minimum amounts. Crazy!! I know right!? From the beginning, I have been very open about my finances with her and we tend to discuss finances quite often. She knows and understands that I am on a mission to retire early and I have expressed to her that I want her to be on that journey with me. We agreed that I would help her become debt free and she would let me take over her finances until the debt was defeated. It takes some serious dedication and trust for someone to just hand over the reigns to your finances in order to improve it. I was ecstatic about it because I knew immediately that I could help her and put her on the right path. 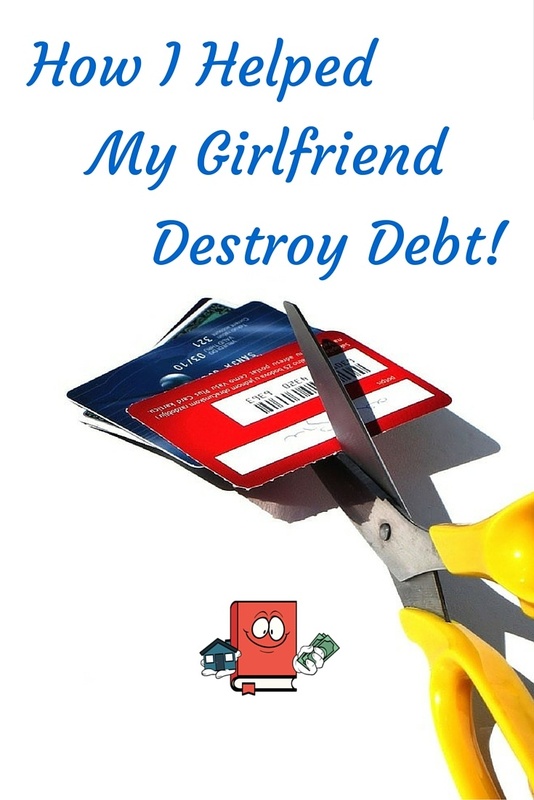 Here are the steps we took in this very order on how I helped my girlfriend defeat debt. 1) I had her create a FREE Personal Capital account. If you do not know about Personal Capital yet then its time you discover it. It’s a financial management tool sort of like Mint but on steroids that lets you track in real-time all your income and expenses. It tracks your net worth and all your spending habits. The reason why I wanted her to create this was so that she could visually see that she was in the negative. Seeing that you are worth negative dollars should have an impact on you. No one should ever be in the negative and if you are, its time you get on a plan similar to this one and start changing your life around. I also wanted her to see where she was spending all her money, not just on bills but every day activity like going to out to eat and shopping. She was quickly able to determine that she spent too much money eating out during lunch and spent way too much money on Amazon. I put her on a “no more going out to lunch” plan which consists of bringing lunch to work. Now she cooks vegetables and other items on Sunday’s (while I watch football) and she uses that food for the rest of the week to take to work. She is saving a ton of money by doing this. She also made a drastic reduction to her online Amazon shopping. I understand Amazon is addictive especially if you have Amazon Prime but you need to control your spending habits or it will quickly get out of control. 2) I made her read The Total Money Makeover . One of the first things I wanted her to do is learn about better money concepts and understand why debt is bad and can destroy you. What better book then Dave Ramsey’s The Total Money Makeover . He is very anti debt and this book is great for any beginner looking to understand how to change your financial life. After she read this, she was more eager to begin this money transformation and was also more educated on the subject. 2) We made a spreadsheet listing every single bill/debt she pays. Making a spreadsheet and being able to see every bill/loan/creditor you owe, how much you owe on it, what interest rate is on it and how much you are paying on it is a very important step. This step is needed because it lets you analyze the data and see where the damage is occurring and which one(s) are the most impact. There are many different strategies in going with paying off debt and I chose to go with pay off the smaller debts first so that she could see progress faster and cancel credit cards faster. She had multiple credit cards and at the end of the day I only want her to have 2 credit cards. One rewards card which she will use for everyday purchases and pay off in full every month. And one emergency card which she will have for emergency purposes only. All other cards were to be cancelled as they got paid off. As the months rolled by, she paid off each credit card one by one. By cutting costs and having a one track mind with full intentions to pay off debt she was able to make major progress. As each debt was paid off we made it a celebration to cut up the card and cancel it. This was a fun way to reward her and show support with what she was doing. As of this past month, my baby is officially debt free!! Whooooooo! Yeahhhhhhhhhhh! Sorry I got a little carried away there. I’m just so happy for her. It took 9 whole months and paying a few thousand dollars per month toward debt to get rid of this so fast. Fortunately she landed a new job just before we started that gave her a significant pay increase and that helped a ton but it was the plan and dedication put into it that helped her achieve success. As of now, I have her on a plan to put away 5k in savings for an emergency fund. She will probably reach this in January in which we will work on the next stages of the financial make over which is investing. Yeah now we are talking my language! I love investing as you can tell by all my rental properties and I cant wait to help her out on this. Do you remember how you felt when you became debt free? Or have you ever helped anyone become debt free? It really is a beautiful thing and has been known to make people’s lives happier. If you are in debt, I hope this story provides inspiration and puts you on the right track to destroy debt! Here are 5 great debt destroying tips that can help. Nice Job. Ramsey’s “Total Money Makeover” was one of the first resources we found that help us get on the path to become debt free. No better feeling than becoming debt free. What’s her planning going forward? Real Estate investing? That “Total Money Makeover” is the real deal if your in huge debt. With or without debt, everyone should read that book for their future use. Thanks! There should be classes in public education (high school) that makes you read that book. That would be a great idea! I agree, I get much more excited helping others become debt free, especially when you see the impact. My folks nearly lost there house of 30 years, their car and some other serious issues. My mother had a mental breakdown and my folks were a hair trigger from divorce after 35 years of marriage. Debt burden is no joke. Now 7 years later, they have no credit card debt, 2 very small car loans (around 3k total to pay off final debts) on 10 year+ old vehicles. They just refinanced their house for $600 less per month and my father can finally retire after working for 50 years. He was so excited to tell me the other day that he nearly drove 1.5 hours to tell me in person. Few better feeling than seeing the results of that. I can honestly say, i am very proud of what they accomplished. Congrats on helping your girlfriend. She clearly has the drive and patience to be successful financially. Wow that is an amazing story of your parents. Really happy to hear they were able to get their finances situated like that. I really need to sit down with my mother and go through her finances as well because she is probably having problems I would imagine. Indeed! There is a lot of trust between us. She is an amazing person and I feel lucky to be with her. One day we will combine financial forces and really make an impact in our lives.